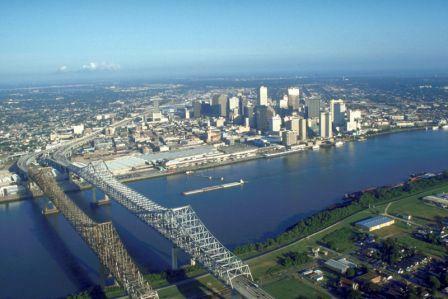 You'll witness some of the best views of the original city of New Orleans via a Canal Street Ferry ride across the Mississippi River, and learn why New Orleans is called the Crescent City as the ferry traverses the river's natural crescent to historic Algiers Point on the West Bank. You can board the ferry, which has been in operation since 1827, at the foot of Canal Street – right next to the Aquarium of the Americas. The ride is free for pedestrians and $1 for cars making the return trip from the West Bank back to New Orleans. From Canal Street to the West Bank, there is no charge for cars. The ferry runs every day from 6 am - 12:15 am, and departs from the New Orleans side at :15 and :45 past the hour. It departs from the West Bank on the hour and :30 past the hour. New Orleans Visitors Center extensive list of things to do and see in the area. The cruise terminals are all on the River Front streetcar (trolley) line, with two stops adjacent to the cruise terminals. For $1.25 per ride you can take a ten minute trip to the Aquarium of the Americas, IMAX Theater, Harrah’s Casino or the French Quarter for a few hours of entertainment before or after your cruise. The Julia and Erato Cruise Terminal Complexes are located in the heart of downtown New Orleans, and are conveniently situated close to hotels and for tourist activities. The terminals are directly behind the New Orleans Convention Center, adjacent to the warehouse district and central business district, and within walking distance of the historic French Quarter. The Port’s signature facility, the Erato St. Cruise Terminal and Parking Garage Complex, opened on October 15, 2006. The building includes a four level, 1,000 car garage that offers the passenger convenient covered parking in a fully secure environment. The Julia Street Cruise Terminal Complex is located within the same building as the RiverWalk Shopping Mall. Parking will be in the Erato St. Garage adjacent to the Julia St. Cruise Terminal. If you prefer to carry your baggage from the parking garage(approximately 75 yards between garage elevator and Julia Terminal), upon entering Port of New Orleans Place get in right lane and go straight into the Erato St. Parking Garage and follow directions below. If you prefer to drop your bags at the Julia Terminal, upon entering Port of New Orleans Place get in left lane and go past the Erato Terminal and proceed directly to the Julia St. Cruise Terminal No. 2. Drop off all luggage except for your carry-ons, and all passengers except the driver. After dropping off all passengers and baggage, proceed to Julia St. and turn left. Go one block to Convention Center Blvd. and turn left. Go approximately one mile to the end of Convention Center Blvd., and turn left onto Henderson St. Go one block and turn left onto Port of New Orleans Place. (You have completed a circle.) Stay in right lane and proceed to the entrance of the Erato St. Parking Garage. After parking, you will take Elevator # 1 at the far end of the building, and go to the ground floor (Floor 1), and walk approximately 30 yards to the entrance for the Julia St. Cruise Terminal Complex (entrance is underneath outdoor stairway on your right). 6-story building; garage on floors 3-6; 1000 parking spaces. Full payment due upon entering the parking garage. Accepted forms of payment: U.S Dollars; Credit Cards. The garage is secure, lighted and patrolled. Handicap Parking available with proof of valid permit. No advance reservations required. Oversized vehicles will be directed to the Poydras Street Parking Lot after unloading luggage. Annual January event at Chalmette Battlefield, New Orleans Louisiana springs back to life with the 1812 Battle of New Orleans Celebration. Feb/Mar annual event - Mardi Gras is one of the largest, most famous and most spectacular parties in the world, drawing hundreds of thousands of revelers each year. For the locals, celebrations start on Twelfth Night (the Feast of Epiphany). Parades then take place each day, picking up speed until midnight on Mardi Gras (the day before Ash Wednesday) when the climactic parades take over the city. January annual event at Armstrong Park, New Orleans. Formed in a bar in 1992 (probably after a few too many), Barkus is New Orleans' only Mardi Gras organization for dogs. With an annual themed parade and ball on the night before the big day. March annual event - Parade starts at 1pm. New Orleans is a city which uses any excuse to throw a party so on St. Patrick's Day the city takes on a distinctly Irish flavor. Hot on the heels of Mardi Gras, New Orleans hosts a uniquely New Orleans St Patrick's Day parade. The parade consists of a number of magnificent floats which travel from the corner of Felicity and Magazine at 1pm on flatbed trucks. Sometimes they carry music bands, sometimes they have music systems alongside which the parade-goers dance. In addition, marching bands and walking groups parade down the street throwing their gifts to the thronging crowds.